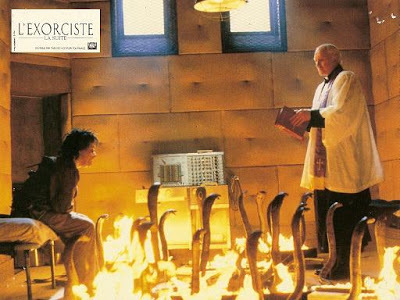 BLACK HOLE REVIEWS: THE EXORCIST III (1990) - who you gonna call? THE EXORCIST III (1990) - who you gonna call? After the disastrous reception of Exorcist II: The Heretic (read more about that here), there was an understandable pause before the next moiver sequel... twelve years! But when the author of The Exorcist hit novel, William Peter Blatty, wrote the sequel Legion, there was an immediate interest in filming it. He also got to direct, having already directed The Ninth Configuration (1980) - a movie that thematically links Exorcists 1 and 3 as the centrepiece of his 'trilogy of faith'. 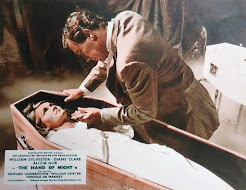 The film wasn't a totally smooth production, with a last-minute reshoot of a sizeable chunk of the climax (when it was finally decided that Exorcist films really should have an exorcism in them). But the tampering is well integrated and it's an absorbing story, totally ignoring the events of Exorcist II, and continuing the story directly on from the original. It opens with Mike Oldfield's haunting theme, 'Tubular Bells'. Once again, the setting is Washington DC, and Detective Kinderman revisits the stone stairs under Regan's bedroom (where the first film ended). Legion is a unique story rather than a movie sequel that blindly blueprints the original. 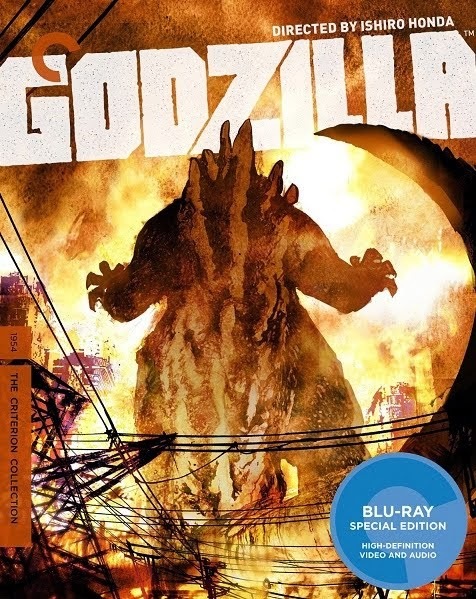 It goes in its own direction, and feels very much a Blatty film, mirroring the humorous dialogue and dream sequences of The Ninth Configuration. Much as I was impressed with it originally, The Ninth Configuration has dated relatively badly compared to The Exorcist III. Kinderman has to face the demonic 'Gemini' serial killer, terrifyingly played by Brad Dourif (Alien Resurrection) in one of his strongest ever roles. I remember first seeing Dourif in One Flew Over The Cuckoo's Nest, and in such diverse productions as David Lynch's films (Dune and Blue Velvet) as well as the voice of Chucky in the Child’s Play series. George C. Scott plays Lt Kinderman, originally portrayed by Lee J. Cobb in The Exorcist, but had since passed away. Similarly, Father Dyer is now played by Ed Flanders, an actor who also starred in The Ninth Configuration. Both Scott Wilson, recently seen in Korean monster movie The Host, and Jason Miller had also appeared in The Ninth Configuration. 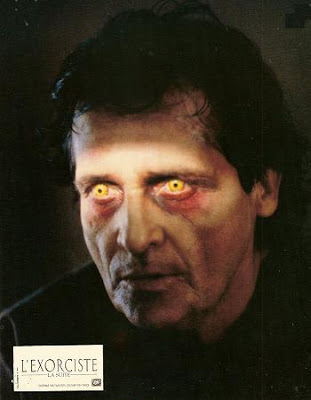 Though Miller is the only actor in the cast who'd appeared in the first Exorcist. The reshot ending adds Nicol Williamson as this episode's exorcist. The end result is a powerful detective mystery with full-strength scares and a high calibre cast. 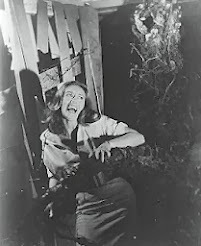 The surreal dreams and bizarre murders place it firmly inside the horror genre. 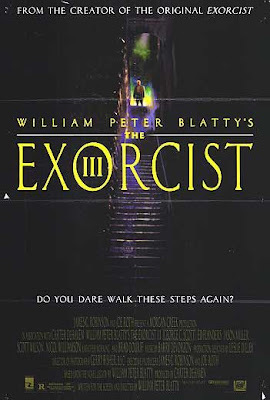 There's much more about The Exorcist III on this William Peter Blatty fansite here. Also a ton of stuff and screengrabbed spoilers for all The Exorcist films on Captain Howdy.com. There's a scene in this film where the patients are all in the day room just sitting around. Then an old lady crawls across the ceiling...! Awesome! It was really great to see WPB's sequel, Legion, make it to film, especially given the weirdness of Boorman's attempt. What were they thinking?!? Sometimes straightforward story-telling is the best way to go. Especially given Blatty's impeccable research for both books.